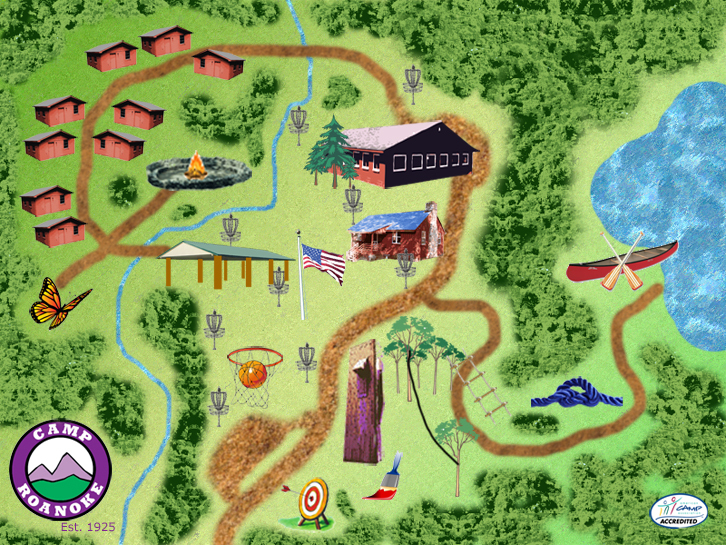 Click on the interactive map below to see a 360 degree photo tour of Camp Roanoke's facilities! OR, scroll down for more information about each of them. Camp Roanoke features eight cabins in a rustic setting, served by a central bath house. Each cabin sleeps ten to twelve people in bunk-style accommodations. The facilities are heated and air-conditioned for use in any season! During the summer, campers spend the week here in cabins designated for either boys or girls. In the Fall or Spring, the cabins may be rented starting at only $15 per person, with a minimum of 8 participants. For cabin rental information, call (540) 387-6114. The campfire ring at Camp Roanoke is the oldest structure on site, constructed of field stone when the camp opened in 1925. Here campers of all ages enjoy storytelling, songs and s'mores. Outdoor and environmental education are important missions at Camp Roanoke. Our campers and visitors participate in programs that emphasize the importance of living in harmony with nature, while learning about some of the science behind the great outdoors. Nature activities include tree identification, creeking, insect indentification, nature crafts and leave-no-trace education. The dining hall at Camp Roanoke seats up to 84 people for buffet-style meal service. Food service professionals on our staff are ServSafe certified to provide high quality hot meals to campers. A typical week at camp includes three hot meals a day off our menu of healthy options. The dining hall also serves as an exciting rainy-day program venue during the camp season. During the Fall and Spring, visitors can rent the dining hall for group meetings and other events. Visitors can choose to provide their own meal service, rent our commercial kitchen, or utilize Camp Roanoke's catering services. Our menu options range from soup, sandwich, and salad bars to full course meals and outdoor cookouts on the grill. Meal prices include all beverages and start at $5 per person. Use the dining hall as a meeting space, with amenities including wireless internet access, a TV/DVD combination, a projector, pull down screen, flip chart stands and dry-erase boards. Please call about rental packages and other options. Dining hall rental contact is (540) 387-6114. The activity lodge is a fun and relaxing destination during summer camp season. Campers come here to enjoy activities like billiards, board games, karaoke, themed gatherings and much more. The lodge holds up to 64 people, and contains a beautiful stone hearth built when the camp opened in the 1920's. Use the activity lodge as a meeting space, with amenities including wireless internet access, a TV/DVD combination, a projector, pull down screen, flip chart stands and dry-erase boards. Activity lodge rental contact is (540) 387-6114. The range features five lanes, and all of the equipment necessary for a fun and safe archery experience. Our range instructors have completed over 16 hours of certification and safety training. During the summer camp season, the arts and crafts room provides a location for creative minds to explore their artistic side. Our staff leads a wide variety of outdoor-themed craft activities for all ages. Spring Hollow Reservoir is a 158-acre body of water located adjacent to the Camp Roanoke property. Campers and visitors receive exclusive access to the reservoir, which is normally closed to the public. During their stay, campers may go out on the lake with a certified lifeguard staff member in one of our 10 canoes. Every trip to the reservoir includes basic canoeing safety, PFD fitting, and lessons in proper stroke and safety techniques. In the Fall and Spring, Camp Roanoke staff leads public recreation programs at the reservoir which include canoeing instruction and environmental appreciation. Private groups may also schedule time on the reservoir with their facility rental. At the heart of Camp Roanoke is a large open field area, which serves as a gathering point for campers and visitors. Here you'll find participants engaged in group games, ice-breakers and a variety of outdoor sports. Visitors may also enjoy our 9-hole disk golf course, horseshoes, volleyball and mountain boarding. Our full-size outdoor basketball court is a popular attraction for many campers and visitors. Camp Roanoke provides all the field equipment needed for this and other outdoor games.